Amir Khan: "Arum Has Approached Us Over Pacquiao Fight" / Floyd "Running Scared"
After all his pitiful Floyd Mayweather chasing came to nothing – with the P4P king looking at a ‘soft’ defence against Andre Berto in September – Britain’s Amir Khan is being forced to look at other options, and has insisted that 2016 is going to be his year, with a potential fight against the returning Manny Pacquiao possible for Dubai. 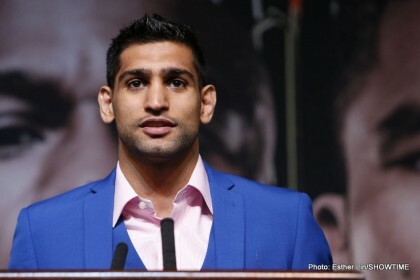 “There have been talks of an Amir Khan fight in Dubai for many years now,. Everyone knows my position: I am ready to fight if they are serious about it. Bob Arum has contacted my team to fight Manny Pacquiao around March or April in Dubai. Let’s see how that develops. Khan has insisted 2016 may also be the year he fights British welterweight rival and IBF champion, Kell Brook, although he is stubbornly refusing to do so until the Sheffield man fights what Khan deems a big enough name. However, any fight against the Filipino superstar is unlikely to happen in Dubai before 2017, as the country’s Sports Council, who would play a large part in commissioning the event, are seemingly unaware of Arum’s intentions. Previous boxing news: Is a Kell Brook v Amir Khan Fight Edging Closer For 2016?